Barel Karsan - Value Investing: When P/E fluctuates...is it Price or Earnings? We saw here that although the P/E average for the S&P 500 over the last 100+ years is around 15, the P/E actually fluctuates quite a bit, ranging from 5 all the way to 35. But what's actually happening? Is investor sentiment so fickle that it creates buying opportunities for those who wait for the market to drop? 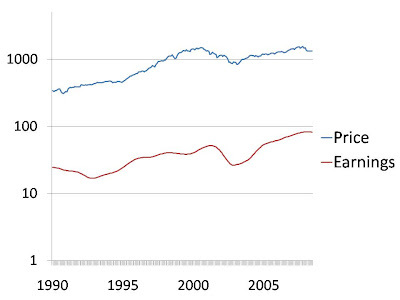 Or do earnings fluctuate based on economic conditions, with prices staying rather stable? We see that both price and earnings fluctuate, providing for the volatile P/E chart we saw here. Obviously, timing the market is not as simple as buying when P/E's are low, since for all one knows, earnings could drop and actually make P/E's high, leaving the investor holding the bag. Therefore, other models have been developed that try to determine whether the market is over/undervalued. The Fed model, described here, uses interest rates along with earnings to determine what the market value of the S&P 500 should be. A model developped by Steve Foerster tries to determine when the business cycle hits its peaks and troughs, so that investors can determine when they should buy and when they should sell. Rather than trying to time the market, value investors try to value individual companies within the stock market, to determine if they sell at discounts to their intrinsic values.